I just acquired an early 90's jetglo 620 and have .10s on it. The tens feel a little light to me at times. I was looking at D'addario 10.5s wondering if i could just put those on without having to readjust the neck or file the nut. What does everyone else use? nhlone wrote: I just acquired an early 90's jetglo 620 and have .10s on it. The tens feel a little light to me at times. I was looking at D'addario 10.5s wondering if i could just put those on without having to readjust the neck or file the nut. What does everyone else use? Whenever one changes string gauge there is the possibility of having to do one or the other or both. Let us know what you find when you change your strings. So I'm assuming everybody just keeps .10s on their 620s? nhlone wrote: So I'm assuming everybody just keeps .10s on their 620s? I can't speak for everybody, but I find it is best for the guitar to keep the stock gauge strings on a guitar. If you say, "Well, I am used to playing .09s; I don't want .010s on the guitar," well, your fingers can get used to the increase in gauge far better than a guitar's neck can. You can put on what ever suits. 10s seem to work well for most people on average (I have them on my 330), but they may not suit your technique, so feel free to experiment. Heavier gauge strings may need a little filing at the nut, and any change should require tweaks to neck relief and intonation. If the 10s feel tight you probably want to move to lighter gauge strings like 9s. As I've gotten older I realize one should always use the same gauge strings on your guitar. If you change gauges, you will, most likely, need to do some modification to the neck, bridge, nut, etc. 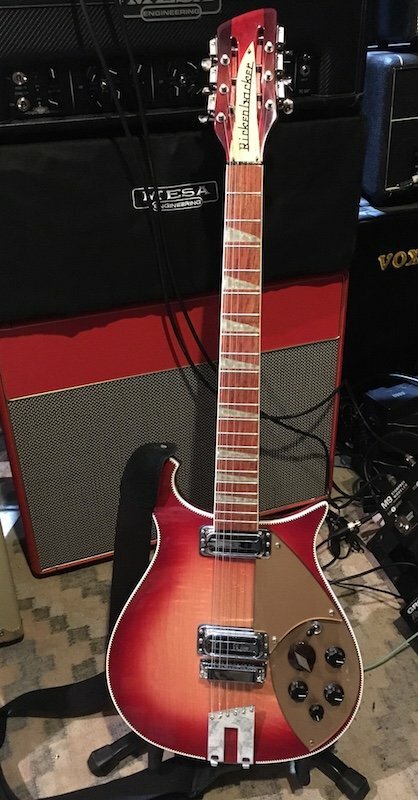 In my younger ignorant days, I owned a 450/12 model Ric, and from time to time would change it out to a six string guitar with no adjustment to anything. How did I get away with that? Never had a problem playing six or twelve. ????? My 2¢: Use the strings that work for you. Rics have a dual truss rod system that will adjust your neck to accommodate virtually any string gauge. Assuming the neck isn't warped, etc, and the truss rod adjusters function as intended, working the with neck adjustments and bridge height will get you what you want. And if you're not skilled in setup and adjustments, take it to a tech. Rics are very serviceable and well made instruments. Completely agree with Tommy Marco. Why try and create a problem ? Keep to the gauge the guitar comes with. To be honest I don't think you would really notice the difference anyway. I have 10s on my 6 and 12 acoustics, on my Fender Tele Thinline, my LP Studio, and my 660/6 and my 330/6 and of course the benefit is all the guitars feel the same string wise without having to touch the neck or worrying about it. andyenobs wrote: Completely agree with Tommy Marco. Why try and create a problem ? Keep to the gauge the guitar comes with. To be honest I don't think you would really notice the difference anyway. I have 10s on my 6 and 12 acoustics, on my Fender Tele Thinline, my LP Studio, and my 660/6 and my 330/6 and of course the benefit is all the guitars feel the same string wise without having to touch the neck or worrying about it. I completely disagree with you and Tommy. Totally WRONG, IMNTBHO. As you know, a 12-string feels very different than the 6-String, even if it's the same brand and model. AND every guitar's neck is slightly differently shaped. AND your Gibsons and Fenders have different frets than the Rics. AND the headstock angles are different, etc. Thus, you're guitars will not "feel the same" even if you do use the same gauge strings. Therefore the player must determine for herself (or himself) what is suitable for that person's playing style and sound. The "factory" can't do that for you. You have only to consider what gauges your guitar heroes use to know I'm correct on this point.